Over the centuries people have gathered around campfires, in town squares and other places to tell their stories, and these gatherings have been central to the shaping of cultures and communities. In more recent times some have lamented that the art of storytelling has been lost amidst the rise of new technologies. Photographs however still have the ability to convey emotion, mood, narrative, character, ideas and messages – all of which are important elements of storytelling. Storytelling by Simone Donati, founder of the photography collective Terraproject, is an event & exhibition by our LdM Photography students. The works displayed in our LdM Church this Thursday, April 23 are the results of two workshops with Donati on the use of photography as a visual storytelling tool. During these workshops students learned to explore photography as a medium to feel, document and create compelling stories, using the Florentine Santo Spirito and San Frediano neighborhoods as their backdrop. 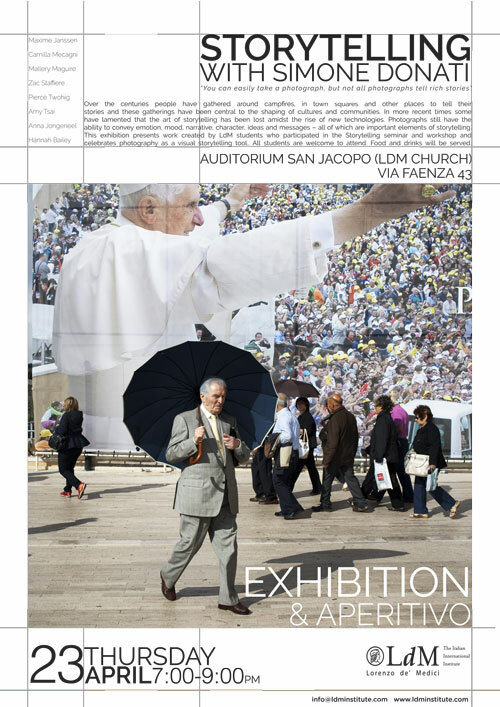 Moderating the event will be LdM professors and photographers Francesco Sammicheli and Gianluca Maver. Food & drinks will be served!